The nurse-led specialist breast cancer service helping patients at home. The journey following initial breast cancer diagnosis can be emotionally and psychologically difficult for patients and families. In Middlesbrough, the Macmillan cancer support breast outreach service aims to improve patient experience by providing specialist care and support at home and facilitating earlier discharge. The service, run by breast outreach nurse Sue Warren, forms part of a breast care team at the James Cook University Hospital which includes two specialist breast nurses and consultants. The outreach service provides hospital care in a home environment, allowing procedures such as drain management and seroma management to be carried out at home. Ms Warren’s post as service lead is funded by Macmillan for two years, with South Tees Hospitals NHS Foundation Trust continuing funding when the charity’s financial support ends. ‘Patients traditionally stay in hospital, post-surgery, for around five to six days while the drains are attached,’ says Ms Warren. ‘Our service enables earlier discharge with the drains still in place. It is a welcome alternative to remaining in hospital when patients are feeling relatively well simply due to the presence of the drains. One major benefit to patients is continuity of care. Patients are introduced to Ms Warren in hospital and get to know her well in the days and weeks that follow through regular home visits and telephone support. Psychological support is also provided; something Ms Warren sees as a key benefit. ‘It is at home when psychological issues hit after having major surgery for breast cancer,’ she says. ‘It all happens so quickly from diagnosis to surgery – often within two or three weeks. It can be a real whirlwind for patients and families. Additional benefits include early detection and treatment of wound complications, which Ms Warren says is a big part of her role. The risk of developing hospital-acquired infections is reduced as a result of earlier discharge. Following breast cancer surgery, patients often require additional treatment. Having fewer post-operative complications enables earlier commencement of adjuvant treatments such as chemotherapy and radiotherapy. Ms Warren has received training from the breast specialist nurses to enable her to provide seroma management at home. A seroma is a build-up of fluid that can collect around wounds following the removal of drainage tubes. It can become very uncomfortable for patients as it creates tension around the wound. As the service lead and sole breast outreach nurse, Ms Warren, who works part-time, covers a wide geographical area and can travel up to 80 miles a day carrying out home visits. She currently has 20 patients on her caseload, although numbers vary. She usually sees six a day. Once patients have arrived at home, Ms Warren will usually visit them the following day. However, if patients have drainage tubes in place, Ms Warren will try to visit every day, although she admits that is not always possible. ‘The service has excellent links with local district nurses and they fill the gaps,’ says Ms Warren. ‘My community colleagues are brilliant; they do not deal with the drains but they provide cover when I am not around. It works well. Patients are seen by Ms Warren typically for two to three weeks following discharge, although support is available as long as it is needed. This is especially the case if patients have particular seroma or wound issues. They may also experience issues such as a sudden build-up of fluid or the development of a wound, but have the reassurance that Ms Warren is just a telephone call away. Feedback from patients and families is overwhelmingly positive, and Ms Warren has been shortlisted in the service improvement excellence category at the Macmillan Professionals Excellence awards, to be announced on November 17. ‘Sue Towes and I are specialist nurses in breast care, and we see patients at the point of diagnosis (along with the consultant) and through the whole treatment trajectory,’ says Sarah Morter, Macmillan specialist nurse (breast and thyroid) at James Cook University Hospital. ‘Historically, we saw patients with any kind of wound problems or for seroma drainage and this took up a lot of our time. In Middlesbrough, we have previously had a high turnover of district nurses and it has not been easy for us to teach and inform everyone involved with patient wound and seroma care. We used to see a lot of varying care for patients post-operatively. 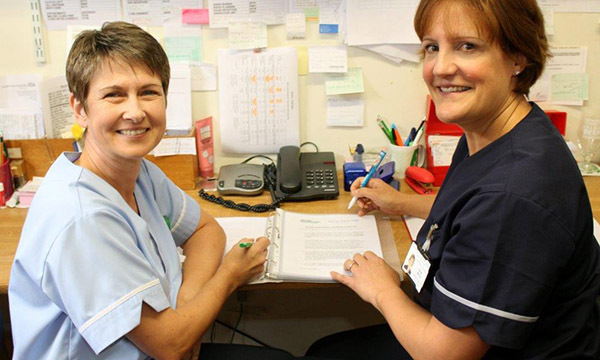 ‘Ms Warren has enhanced our team and has allowed us more time to develop nurse-led services. The outreach service provides excellent continuity of care for patients from when they leave hospital. ‘Patients feel reassured when the nurse coming to see them that is an expert in their field and someone that is in close contact with their specialist nurse and consultant. ‘I am quite an anxious person and it was a massive shock when I was diagnosed,’ says Susan Angus. ‘I cannot put into words what an incredible comfort it was to have the care and support from Ms Warren. ‘Your world is turned upside down when you receive that diagnosis. I am reasonably healthy, there is no family history of breast cancer and it was a difficult time. ‘When I came out of hospital, I just did not know what to expect. The service was a great support for me and all the family.